3 more weeks to checked-off you Christmas gift shopping lists! Ayala Center Cebu will help you tick off those items plus a bunch of treats to Ayala Center Cebu Mall goers from Holiday Rush Sale, Christmas Gift Bag Promo, Concert Series, Ballet Performances and more! 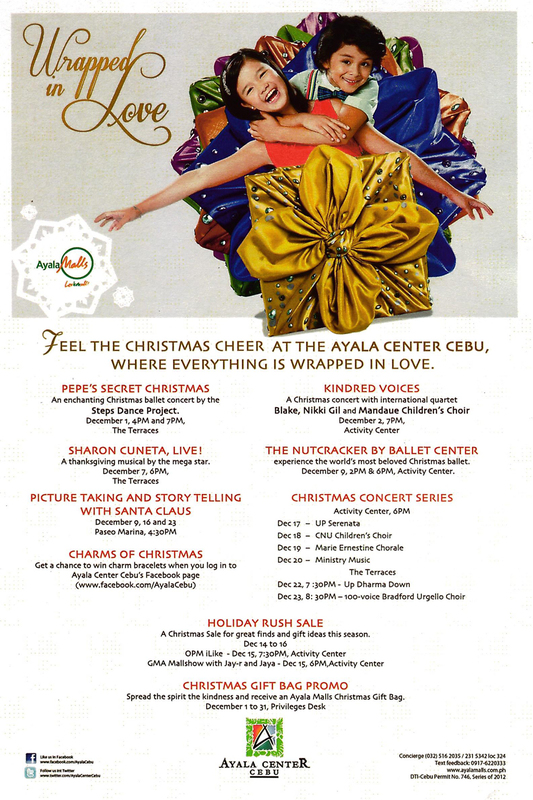 Ayala Center Cebu will begin its December with an enchanted ballet Concert in December 1 with Pepe's Secret Christmas. 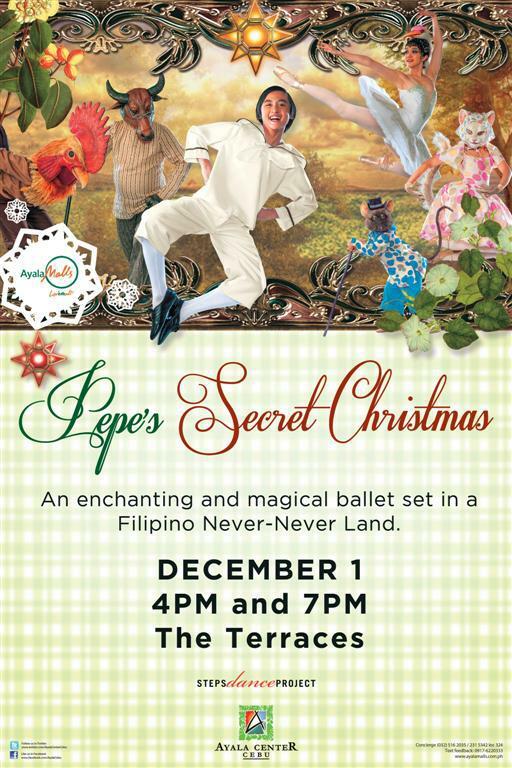 Dream come to life for Pepe, find out more about the Pepe's Secret Christmas Ballet Concert with Play schedules 4PM and 7PM. Pepe's Secret Christmas is STEPS Dance Projects's Christmas Offering for 2012. It features original choreography set to music so audience can connect to it. December 7, 6PM - Sharon Cuneta, Live! Feel the Christmas Cheer at the Ayala Center Cebu, where everything is wrapped in Love. 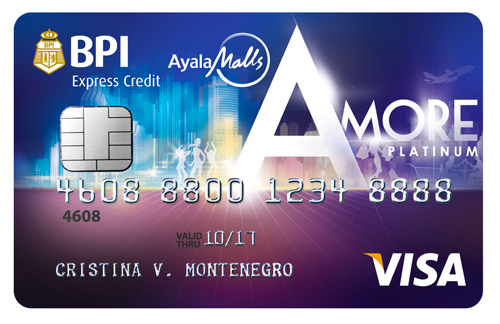 Ayala Malls and BPI Express Credit introduces the BPI Ayala Malls AMORE Visa credit card, the first mall lifestyle credit card that gives shoppers access to the ultimate mall and lifestyle experience. With AMORE Visa credit card you can earn shopping rebates, discounts and freebies at participating merchants and many more mall perks and privileges in all Ayala Malls: Glorietta, Greenbelt, Alabang Town Center, Ayala Center Cebu, Market! Market! Bonifacio High Street, TriNoma, Marquee Mall, Abreeza Mall, Harbor Point and Centrio Mall. AMORE Visa credit card, let shoppers can enjoy instant discounts and freebies in participating merchant stores and enjoy unlimited use of customer and family lounges and e-lounges. They also get exclusive invites to sale events, workshops, and promotional activities. Movie aficionados on the other hand get exclusive invitations to movie block screenings and enjoy a cinema express lane and a 5% discount on cinema ticket purchases. Application forms for a BPI Ayala Malls AMORE Visa credit card are available at the Ayala Malls concierge, BPI Branches and Express Banking centers or by logging on to bpicards.com. 0 comments: on "December at Ayala Center Cebu & the new BPI Ayala Malls AMORE Card"